A visit to Rundle Mall usually means a visit to an underground food court when the inevitable need for sustenance kicks in. Now there is an alternative – an outdoor sanctuary that transports you to burger heaven. Complete with artificial lawn and shaded umbrellas, the Coopers Burger Shack is the place to stop and recharge during your shopping spree. 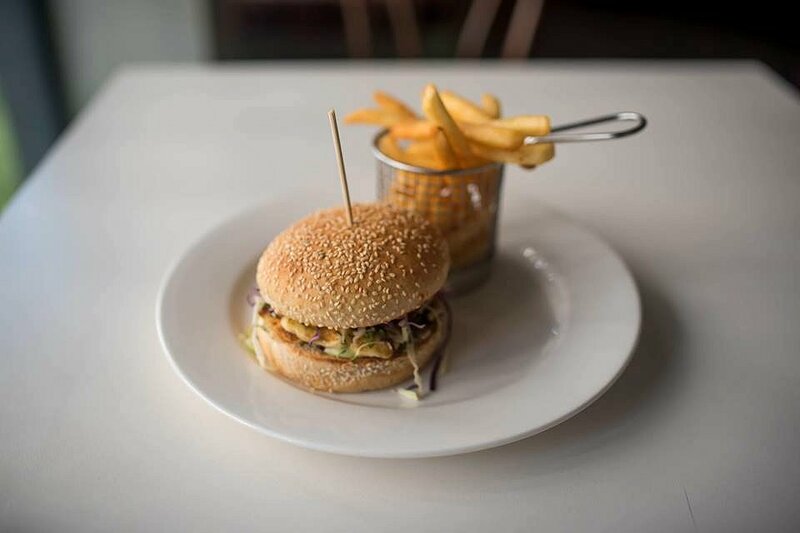 You will find the Coopers Burger Shack opposite the Hotel Richmond, nestled behind a white picket fence that separates you from the hustle and bustle of the mall. Offering a choice of seven burgers you can pair with a matched beer and some perfectly golden, crunchy chips. Fluffy and light on the inside, salty and crispy on the outside, these chips are so easy to devour and impossible to stop (I tried many times). Obviously, you are going to want a burger with your beer and delicious chips – I’m going to put a solid recommendation behind the Cheeseburger. 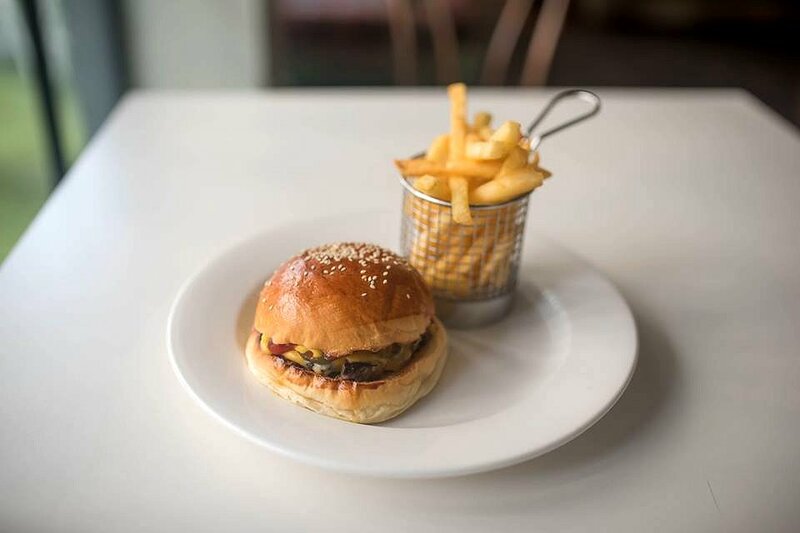 A rich brioche bun contains a thick wagyu beef patty. At first I was a little disappointed that the patty, while still juicy was cooked right through. Happily this disappointment melted away on the first bite as I embarked on one of the best cheeseburgers I have ever had. I was attempting to show some restraint and not consume the whole burger. But so smitten was I in the cheeseburger perfection it was gone before I knew what happened. Tangy ketchup, American mustard, pickles and not one but two (Swiss and Cheddar) types of cheese make up the rest of the mouthwatering burger and the combination is flawless. If, like me you find a cheeseburger the greatest fix after a big night out – make this your first stop the next day. Cheeseburger aside, there are 6 other burgers on the menu – all presented in a thicker sesame seed bun. We tried a Haloumi Burger that contained a generous serve of grilled cheese, paired with coleslaw, shredded beetroot, slightly sweet house chutney and a Herbed Aioli that is included in several burgers on offer. The aioli has a subtle garlic flavor and is spiked with herbs, predominantly dill, providing a freshness and elegance to the mayonnaise. 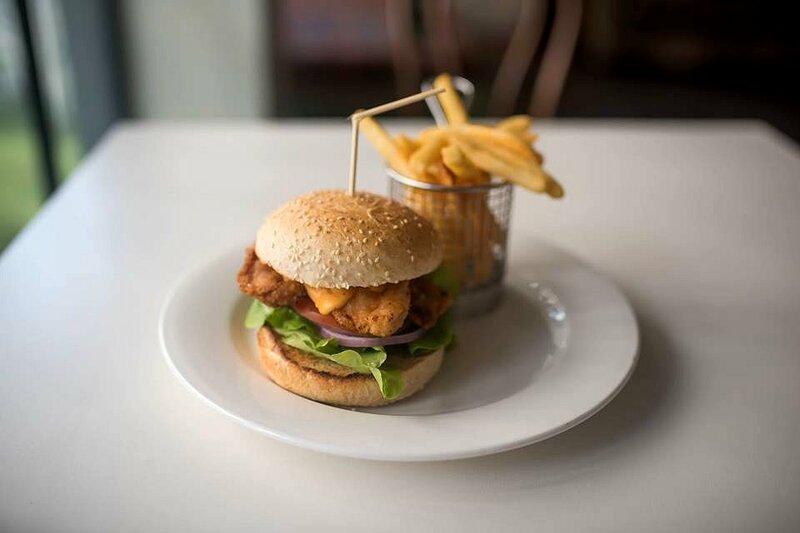 The chicken in Thom’s Chicken Burger is a lightly battered thigh fillet. Combined with layers of butter lettuce, tomato and Spanish onion the burger is finished off with a tasty Paprika Aioli. If a great selection of burgers filled with fresh ingredients, awesome chips and a wide selection of Coopers beers isn’t enough. The attached Coffee Central stand has some of the best coffee in the Mall and a commitment to supporting local charities. Everyone wins!